The Zeiss LWZ.2 15.5-45mm T2.6 EF Mount Lens combines the sharp resolution, high contrast, low distortion, and perfect color rendition of Zeiss lenses with the cinematic features of professional video lenses. The lens is protected with T* XP coating that prevents flare and the glass is color matched with all Zeiss cine lenses to deliver a consistent, superb, optical image. It covers a wide range of focal lengths, making it ideal for shooting in tight spaces or when swapping out lenses is not an option. This lens is 8" long and comes equipped with 15mm rail support. The use of a support rig with 15mm rods (not included) is highly recommended. 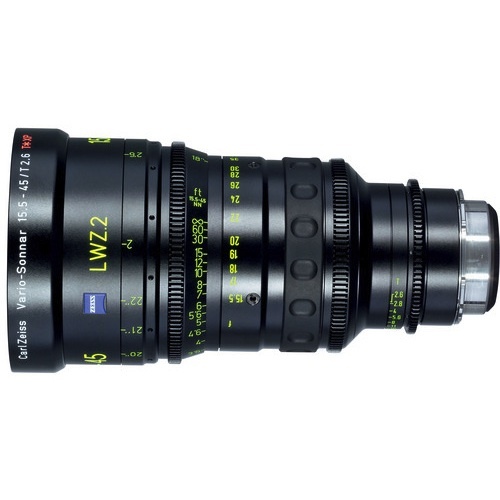 If you are looking for the PL mount version of this lens, see the Zeiss LWZ.2 15.5-45mm T2.6 PL Mount Lens. • This manual focus only lens is intended for Super 35mm sensor cameras and will vignette on full frame sensors. • We strongly encourage the use of a complete rail support system with 15mm rods (like the Cinema Bundle or eyeSpy) with this lens as the EF mount is not intended to support such a large lens without additional support.